Nocatee is now the nation’s 10th top-selling master-planned community, placing it at the forefront of a nationwide trend of surging sales in master-planned communities. 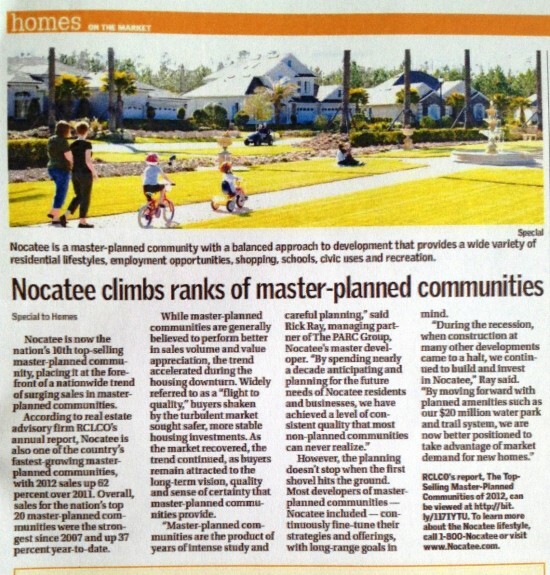 According to real estate advisory firm RCLCO’s annual report, Nocatee is also one of the country’s fastest-growing master-planned communities, with 2012 sales up 62 percent over 2011. Overall, sales for the nation’s top-20 master-planned communities were the strongest since 2007 and up 37 percent year to date. While master-planned communities are generally believed to perform better in sales volume and value appreciation, the trend accelerated during the housing downturn. Widely referred to as a “flight to quality,” buyers shaken by the turbulent market sought safer, more stable housing investments. As the market recovered the trend continued, as buyers remain attracted to the long-term vision, quality and sense of certainty that master-planned communities provide. However, the planning doesn’t stop when the first shovel hits the ground. Most developers of master-planned communities—Nocatee included—continuously fine-tune their strategies and offerings, with long-range goals in mind.